The preparations for the AW16 collection have started and Trine Lindegaard has continued her collaboration with ITMV (In Line with the World) in Ishøj and Rødovre. It is a pleasure as always doing workshops with the immigrant women at ITMV and the collection is taking shape. The theme for the new collection is; favourite dishes. The women have therefore been asked to describe their favourite dish and transform it into embroidery. It has been a couple of days filled with laughter, new food experiences and interesting talks about culture and food. Trine Lindegaard wants to focus on the way we present, eat and experience food between cultures. 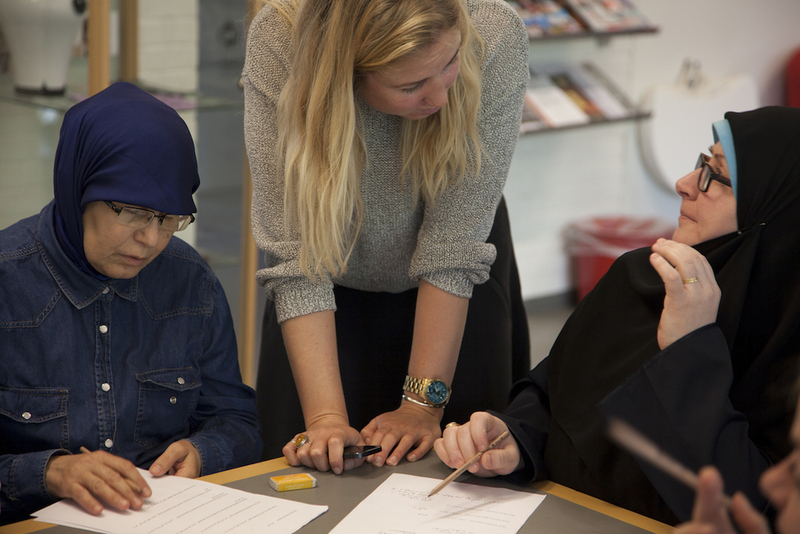 The workshop started with a questioner about the women’s favourite dishes, how they like to eat, what they think of the Danish food and what differences they see between food from their own culture and the Danish. With fabric remnants from former collections, fishnets and other materials sponsored by a retired fisherman in Jutland, the women were asked to embroider their favourite dish. The library in Rødovre, where ITMV have their daily routine, was transformed into a colourful kitchen with tomatoes, meat, rice and potatoes cut out of fabric. The women at ITMV start their day with yoga, to prepare the shoulders, hands and fingers to embroider and sew for the next few hours. The atmosphere is light and cheerful and spending time with the lovely ladies always gives you something to smile about. At ITMV in Rødovre the women introduce the local to new food experiences by serving lunch every other Tuesday. The women decide what to cook and usually make something from their home country. This is a way for the women at ITMV and the locals to meet between cultures and try new things. The library is open for everyone everyday and usually the local pensioners join for at cultural taste every other Tuesday. The Trine Lindegaard team was lucky to be at the library one day, where the Turkish dish; Dulmas was served. Two of the women were in the kitchen while the others embroidered. The women told us, that they are proud to be serving the food and that the locals usually like the different tastes, even if it is a bit more spicy than the more traditional Danish food they usual eat. Eating together is a good way to meet between different cultures and we at the Trine Lindegaard Team wish we could join the lovely ladies from ITMV for lunch in Rødovre everyday.